You deserve it! 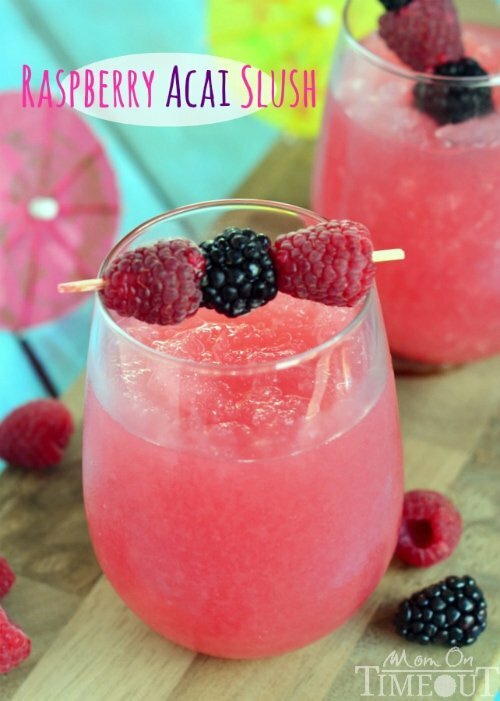 It’s time to relax with this delicious and refreshing Raspberry Acai Slush! It’s not too often that I get to spend a night with my girlfriends. We usually sneak in a dinner here, a movie there, or combo up a walk with catching up on each other’s lives. Life is busy people. I’m sure I’m not alone in this. A girls’ night in is really a dream for me and one I need to make a reality…like, soon. A night with no kiddos to referee, no husbands to take care of, no stress. Doesn’t that sound awesome??? 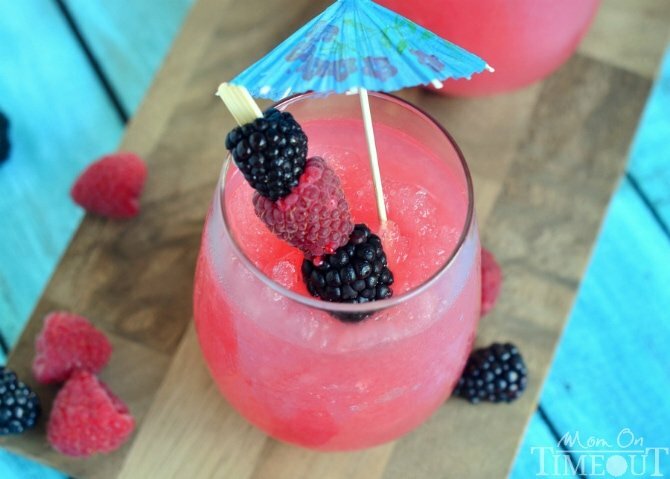 I love easy, carefree entertaining and this slush is definitely that. You can totally mix it up ahead of time and freeze. If you make it with alcohol, it won’t freeze completely so you can take it out right as the party begins. Making it without? Just remember to take it out about 20 minutes before you expect your guests to arrive. I made my slush with lemon-lime soda but ginger ale or club soda would be perfect as well. I think the presentation is really where it’s at with girls so I like to serve the slush with frozen raspberries and strawberries and little umbrellas if you have them. On the healthier side – Veggie Crescent Bites, Mojito Fruit Salad, and Balsamic Watermelon Salad. And for a little indulgence – Lemon Meringue Cookie Cups, Cherry Fluff, and Chocolate Chip Caramel Cookie Bars. All would go awesome with this Raspberry Acai Slush! Combine ingredients in a freezer-safe container and freeze at least 8 hours. Rinse berries and place on a parchment lined baking sheet so the berries are not touching.. Place in freezer for a minimum of 30 minutes to freeze. 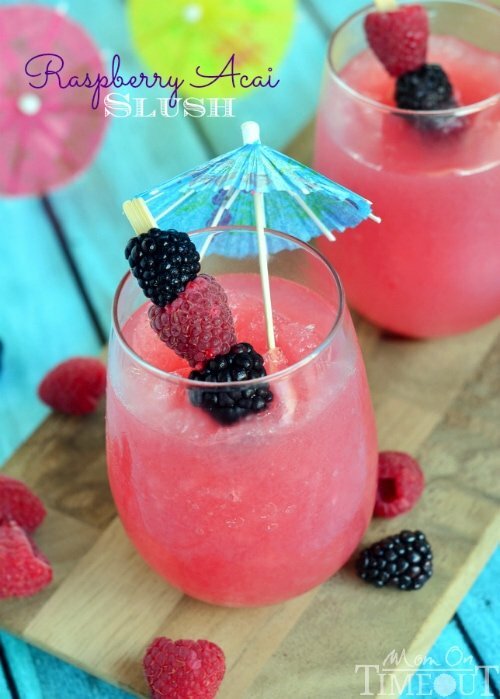 If using alcohol, the slush will not freeze solid and is perfect straight from the freezer. If not using alcohol, remove from freezer 20 minutes before serving. Serve with frozen raspberries and blackberries. 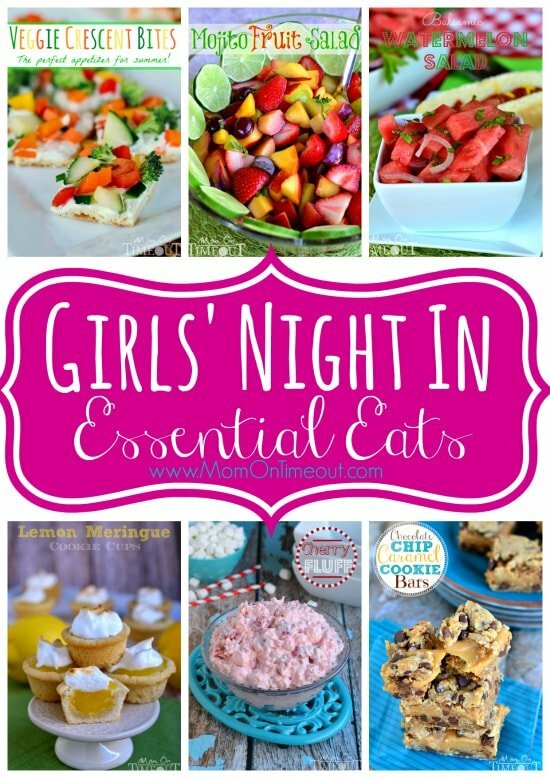 Here are some more awesome ideas for your next Girls’ Night In! And make sure to check out this Pinterest board for even more inspiring ideas and recipes! Remember that it is not safe to store them in the garage. Always remember that the pleasures you get from any experience is not worth your life. charcoal, solar ovens don’t need anything to work other than the natural heat generated by the sun. Oh wow, this looks super delicious! Makes me want one right now! Just stopping by to pin this and to let you know I featured it on my blog today! Thank you so SO much Jessi! Hope you’re having a great week! That’s wonderful! Thank you Crystal! Hi Trish! I just wanted to let you know that I am totally in love with your Slush, and it’s one of this weeks Rockstars at Creativity Unleashed! Grab your crew and pop over to vote to be the MEGA Rockstar this week! PS. A Girl’s night in sounds delicious!!! Wow! Thank you so much Gwen! This looks absolutely yummy and refreshing! Definitely pinning this one! Thanks for the post. Thank you so much Shayla! Yum! This is definitely something to try – but I’ll switch it up to more a Girl’s Day In when school lets out for the summer and myself and teacher friends can hang out. Delicious recipe. What a fun and easy drink idea! Also, rum is my favorite. I’m going to pin this and most likely make it this weekend for a get together I have planned with friends! Forgot to mention, visiting from SITS!